Congratulations to Carl Scott, winner of last week’s Friday Freebie: Evergreen Tidings From the Baumgartners by Gretchen Anthony. In Catch, Release, Adrianne Harun’s second story collection, loss is the driver. But it’s less the usual somber shadow-figure of grieving than an erratically interesting cousin, unmoored, even exhilarated, by the sudden flight into emptiness, the freedom of being neither here nor there. In this suspended state, anything might happen―and it does. Harun’s most realistic stories are suffused with mystery, while her more fantastic tales reveal startling truths within the commonplace. In diverse settings that include, among other places, a British Columbian island, a haunted Midwestern farmhouse, a London townhome, and a dementia care facility overpopulated with dangerously idle guardian angels, characters reconfigure whole worlds as they navigate states defined by absence. In “The Farmhouse Wife,” a young couple, struggling financially, takes up residence in a near-abandoned farmhouse, only to be joined by an inconvenient roommate, a woman whose own bereft state proves perilously seductive. A kleptomaniac father gets caught in one of his petty thefts in “Pearl Diving,” propelling his two sons out of one life into another, perhaps more appropriate, one. In “Madame Ida,” a family of little girls steadily invades a woman’s life as she puzzles out the mysteries of a missing sheriff-turned-cult-leader and the absence of her own son. And in the title story, two teenagers face off against the hurtful lies of an ancient con woman who is mining a widow’s grief for her own ends. 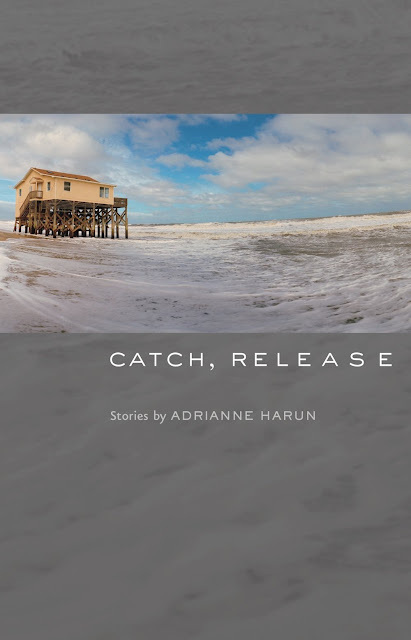 Adrianne Harun has been described as an exacting and attentive stylist whose stories are rendered in vivid language. The Los Angeles Review of Books wrote of her work: “Harun finds beauty in pitch black; she makes poetry out of brutality and grace out of terror. She is an alchemist, turning the worst aspects of life into gold.” With Catch, Release, Harun upends the world once more. Put FRIDAY FREEBIE in the e-mail subject line. Please include your mailing address in the body of the e-mail. One entry per person, please. This contest is open to U.S. addresses only. Despite its name, the Friday Freebie remains open to entries until midnight on Nov. 8, at which time I’ll draw the winning name. I’ll announce the lucky reader on Nov. 9. If you’d like to join the mailing list for the once-a-week newsletter, simply add the words “Sign me up for the newsletter” in the body of your email. Your email address and other personal information will never be sold or given to a third party (except in those instances where the publisher requires a mailing address for sending Friday Freebie winners copies of the book).